Runners rejoice…the New York Marathon is underway this weekend! Thousands of runners are descending upon New York City and are racing for their best. But with 26.2 miles to traverse, marathon runners are prone to injuries. And you definitely want to know what to do when you’re crossing the Queensboro Bridge and find pain shooting through your foot. Whether you’re tackling the marathon this weekend or jogging around the block, Running Free of Injuries by Paul Hobrough is packed with helpful information for how to run your best and stay pain-free. What is it? 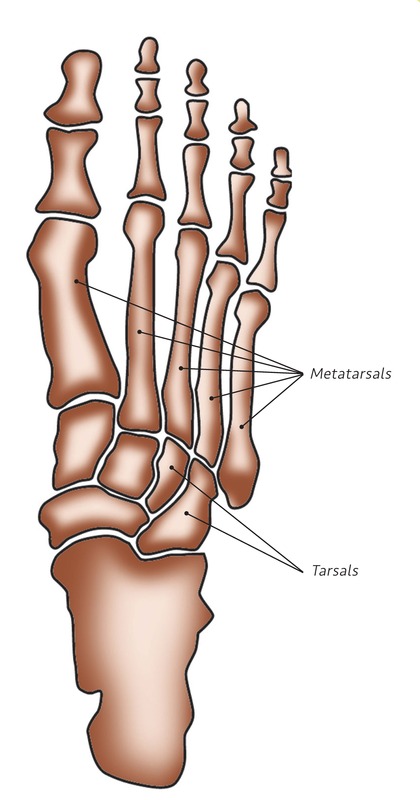 A stress fracture is an overuse injury, common at the metatarsal bones in the foot, navicular, and the tibia. How do you get it and what are symptoms? The stress fracture is developed following a repeated movement that stresses the bone, causing micro trauma from submaximal loading. The appearance of a stress fracture brings pain on movement, which increases as movement is repeated, but abates with rest. The pain is characterized as being very local. What is it? The Achilles is the tendon that attaches the gastrocnemius and soleus muscles to the calcaneus. The Achilles is such a common area for runners to injure that only the knee can knock it off the top of the injury leader board. How do you get it and what are the symptoms? The pain felt at the Achilles is noticed more as stiffness initially, first thing in the morning. Other warning signs include tight calf muscles and loss of dorsiflexion. The injury cause is largely unknown, despite several Internet articles suggesting that it’s down to poorly fitting shoes, bad running technique or, my personal bugbear, due to over-pronation. The fact is, we just don’t know what the main cause is for developing Achilles pain. What we do know is that the tendon itself breaks down. How do you treat it? Achilles tendinopathy can be treated with several modalities from the physiotherapist, but there are also surgical options. The physiotherapist will use soft tissue massage on the calf muscles and into the foot, ankle joint mobilizations and foot mobilizations. You may well be prescribed in-shoe orthotic inserts if the biomechanics of the foot and ankle are perceived to be at fault. Eccentric or appropriate loading as outlined in the next section are the key route to being free from this common running ailment. However, if the appropriate loading process fails, for those resistant tendons that just don’t respond to the normal physiotherapy, there is shockwave therapy (SWT), a series of shocks derived from lithotripsy, which in layman’s terms is breaking up of hard substances. What is it? ‘Shin splints’ is the non-medical term for medial tibial stress syndrome (MTSS) (Czyzewski, 2012). Shin splints are the bugbear of so many runners, especially for those runners in their second month of training for their first marathon or half marathon. It’s my experience that runners tend to get more injured in their first year of training than in the whole of the following five years! How do you get it and what are the symptoms? Symptoms include dull aching pain at the front of the lower leg, loss of ankle plantarflexion, and pain on lifting toes against resistance. The pain usually is at the start and end of a run initially, and as the injury progresses the pain will get worse. Risk factors have been shown to be increased body mass index (BMI), poor alignment of the small bones in the foot, a loss of plantarflexion (ability to point the toes) and a loss of hip rotation externally (Baker et al., 2001). What this means is that there are key factors of a biomechanical nature that cause overload to the muscles of the lower leg. These muscles can be overloaded through poor biomechanics and also over-training, therefore to fully understand the mechanism of injury is the route to complete rehabilitation. How do you treat it? The treatment is threefold: 1) to stop further injury, 2) reduce inflammation and to strengthen, and 3) lengthen the muscle tissue. Therefore there is a period of ‘relative rest’, which means rest from the aggravating activity, but not just sitting on your couch for the next six weeks. There are plenty activities you can still do to keep fit and aid the rehabilitation. For the inflammation and healing promotion, use ice and compression, and for the muscle rehabilitation, the introduction of a stretch and strengthening programme. There is also a need to look at the wider biomechanics to assess if there is an overload of the tibialis muscle group as result of poor form, or to exclude this and instead research the training load prior to injury for signs of overuse. Adapted from Running Free of Injuries by Paul Hobrough. Good luck, New York Marathoners! Which common runner’s injury do you tend to suffer from? Pick one of the three below and we’ll answer questions about it in an upcoming post. This entry was posted in Marathon, Running and tagged injury prevention for runners, New York Marathon, NY Marathon, Running Free of Injuries, running injuries. Bookmark the permalink.